Patience hat firmly camped upon my head, I set my sights on Samuel. His children had gotten me nowhere. His wife, still a mystery. With no documentation to back up the claim in the Blue Book, I felt I had to entertain other possibilities. I took another look at the land records, and reviewed the county boundary map. I platted the land using this deed platter tool. I was able to give a reasonably good guess as to the location of Samuel's land based on landmarks and other, more recent, maps of the area. I knew that the land was originally situated in Ulster County, that it was annexed to Orange County in 1798, and by 1809 when Sullivan County was carved out of another piece of Ulster County, Samuel's land lay right along that boundary. I mean right along. Time to venture into Sullivan County! First, I supposed that Samuel may have died, or was buried, in Sullivan County and not Orange County. I combed FamilySearch and Ancestry. I was disappointed to quickly discover that Sullivan County probate records were not listed among the offerings, even the unindexed, image only records. Plan B. Or was it X by now? Nothing had been easy on this quest, why should now be any different! I contacted the Sullivan County Historical/Genealogical Society, the search fee was a non-refundable $40.00. None of their records were online. IF I was in New York I could visit the museum where the records are housed and search to my heart's content. If. Well, that wasn't happening any time soon. I decided to look elsewhere first, not wanting to spend $40.00 on an imagined hunch, at this point. On the Town of Wallkill ("where happy babies are born") website I found a nice write-up on the town's history. There I read this on the subject of churches, particularly presbyterian churches (Samuel was a presbyterian, remember? ): A fifth church was organized in 1799 in an area between the present Fair Oaks and Bloomingburg. the meeting house was known as "The Old Union House." Oh! Looking up Bloomingburg(h), I learned that it is just, I mean JUST inside the county line of Sullivan County. A crumb! Back in the OCGNY yahoo group, I asked about this church. And further stated I was seeking Samuel Faulkner. Samuel was a church elder in 1799! According to the History of Orange County book, page 460 (which I had not previously seen) the church was called Union Church at New Shawangunk. The book also says that "This church had a house of worship known as the "Old Union House", on the present Shearer place, near the Bloomingburgh Mills, The cemetery still indicates the site of the early meeting-house." Where next? Why Find A Grave, of course! Guess what!? There is a Bloomingburg Rural Cemetery! Exactly where it should be, just inside the county line. Oh, and it gets better ....... guess who's buried there? Yup. And next to him? Helen. Could easily be Elinor, right? But I needed to be certain. I emailed the memorial creator to find out more. Funny story. She was doing research on another family linked to the Bulls and discovered this cemetery. She befriended the cemetery record keeper, (the woman who lives across the street from the cemetery, I kid you not!) and started helping log the names on Find A Grave. She had no more information but did give be the record keepers info., suggesting I try contacting her. I did. It was a hoot! She acquired the records when she bought the house. They were stored in the basement. She thought about giving them to the historical society (she may have by now, this was back in 2013), but people kept stopping by and I guess she liked to help out. Anyway, she had no more information. But I had another three names. Next to Samuel are buried Helen Faulkner, Margaret Faulkner Horton and Gabriel H Horton. The Horton family and I had crossed paths previously. They are also woven into the Bull family genealogy and are another founding family of the Wallkill area. Perhaps a stroll down the Horton path might prove illuminating, I thought. I found Gabriel H Horton in the Horton Genealogy book. Page 131 - 132. It was a sketch on Harrison Faulkner Horton, Gabriel and Margaret's son. 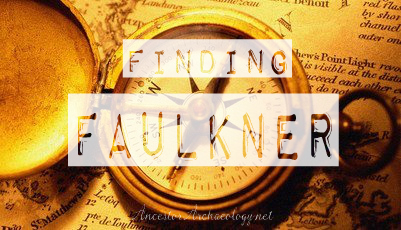 The author goes on to throw a monkey wrench into all my research: "Margaret Faulkner, the mother of Harrison, was the daughter of Samuel Faulkner and Helen Murray, who were early inhabitants of Orange Co, NY, and pioneers in Wallkill Township. Samuel Faulkner was of French origin. (what!?!) His wife Helen Murray came from Scotland. Samuel Faulkner and his brother Col. William Faulkner were staunch Whigs in 1776." Oh now, come on. Just come on. French? And now there's Helen Murray. What happened to Elizabeth Wilkin? The part about Samuel's brother was encouraging, that's what I suspected as well. And it does line up with the will of William Faulkender, the quest is still pointing in the right direction. I take this new information with a grain (boulder) of salt, the book was not sourced. However, in the interest of getting it right, I will need to investigate further.